Lucky Dog Stamper: Freshly Made Sketches #52 - One Year Anniversary! 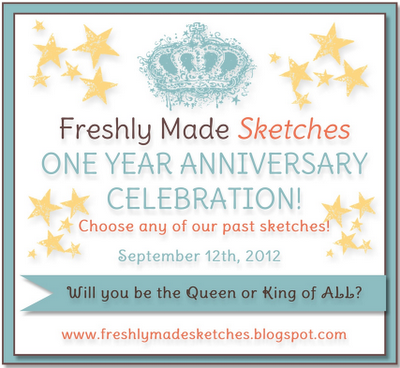 Happy Anniversary Freshly Made Sketches! One year of awesome sketch challenges! Happy Wednesday! And happy first anniversary to Freshly Made Sketches! Woohoo! I am thrilled to be able to share in this special day! This week you get to choose any of our past sketches here! I needed to make a birthday card for my sister-in-law and I wanted to use the Girly Graphic T-shirt stamp and die from My Favorite Things. This fun set has been sitting on my desk waiting for some ink. Now I needed a sketch - so I pulled out my handy dandy printout of all past Freshly Made Sketches to find the perfect sketch. I didn't have to look far - Sketch #4 was perfect! I stayed pretty true to the sketch. The hardest part was trying to decide what color card stock to use for the T-shirt (had to bring hubby in on the decision). I'm happy with how the card turned out. I hope my sister-in-law likes it! Be sure to stop by Freshly Made Sketches and check out all the wonderful creations from the Clean Team! And please come and play. I'd love to see the sketch you choose and what you create with it! Oh my .... how super is that t-shirt design - love it! That wood paneling in the background is the perfect backdrop ! Happy Anniversary Linda .... what a wonderful year it has been and I am grateful to have worked with you and to have been inspired by you! Thank you! Thanks Tui! That is so sweet! I love being part of the FMS team and hanging out with all you awesome ladies too! Love it Linda!! 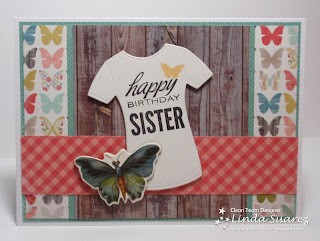 The butterfly is such a great touch to the card with the background matching paper!! How cute you used a t-shirt for the tag! Adorable card! What fantastic patterned paper you've chosen! And that t-shirt is so awesome! Oh my gosh! This is just too cute! That little T-shirt is the bomb! Great card Linda! I love that t-shirt and butterfly! I'm sure your sister-in-law will love it too! Love the paper choices!!! So creative! This card has the perfect combination of fun, funky and cute! Another great card, Linda! I love the papers that you chose, and that T-Shirt is so cute! Great birthday card; I'm sure your sister-in-law is going to love it!